On 6 Jul and 9 Jul, there were separate announcements on SGX that Tamaris Infrastructure (Salim controlled vehicle and major shareholder) and Gateway have raised their stake in Moya. What is so interesting about this? Typically, when a company issues rights, it will issue rights at a discount to the “mother share”. This is because the aim of the rights issue is to raise funds for the company. Thus, the company will naturally want as many shareholders to subscribe for their rights shares. However, Moya issued rights at $0.095 at virtually no discount. Furthermore, Tamaris Infrastructure (Salim controlled vehicle and major shareholder) has undertaken to take 965.6m rights shares equivalent to S$91.7m in value. This seems to be a “private placement” to a major shareholder while allowing the public to participate (so that they don’t have dilution) if they wish. 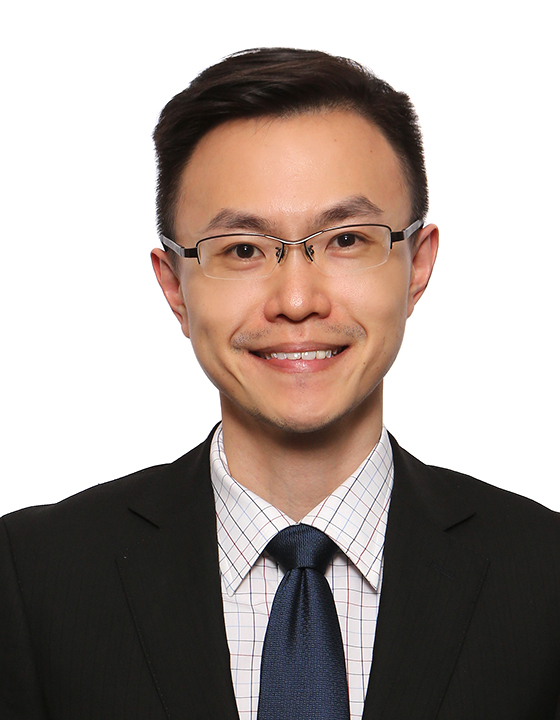 After the proposed rights issue announcement on 22 May 2018 (refer to the announcement HERE for more details), Moya’s share price dropped below S$0.095 and touched a low of $0.085 on 11 Jun 2018. 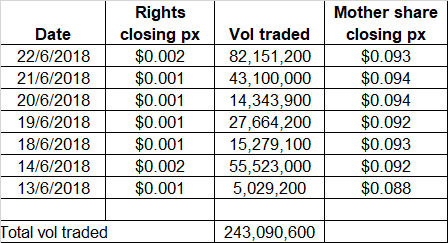 The rights were available for trading from 13 Jun 2018 to 22 Jun 2018. The mother share was trading below the rights’ exercise price during this period. Theoretically, there should be zero value in the rights shares. 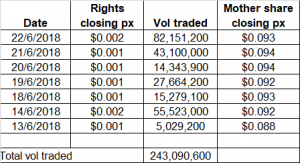 However, there was active trading of the rights shares (See Table 1 below). In fact, the rights traded to a high of $0.002 on some days. This leads one to wonder who will buy the rights shares at $0.001 or $0.002 and exercise the rights at $0.095 (total cost, excluding brokerage is around $0.096 – 0.097) where the mother share is trading between $0.088 – 0.094 on a closing basis. My personal guess is there are some large players who want to increase their stake in Moya. However, if they are going to buy such substantial volume in the mother share, they would have significantly raised the mother share’s price. Average 30D volume for Moya’s mother share is only around 2.7m shares. On 6 Jul and 9 Jul 2018, there were separate announcements on SGX that Tamaris Infrastructure (Salim controlled vehicle and major shareholder) and Gateway have raised their stake in Moya. There is one extremely interesting point which I have summarised in Table 2 below. From Table 2 below, if you compare the rights share entitlement (green) vs # of rights exercised (red), both Tamaris and Gateway have increased their stake above their entitlement. I guess they can do this in mainly two ways. Firstly, they can buy the rights shares on the open market and secondly, they can subscribe for excess shares. Personally, I think this seems to be a strong positive signal from the two shareholders, especially Gateway (which first bought 286m shares @$0.110 via a conditional sales and purchase agreement on 5 Apr 2018) that they believe Moya has prospects and (perhaps) undervalued at current price. d) Other indicators such as OBV, MFI, RSI and MACD are showing signs of strengthening. All in, it looks quite positive and odds are good that it may be able to breach its month-long consolidation $0.091 – 0.095 on the upside. A sustained break below $0.086 with volume expansion negates the current (tad) bullish outlook. 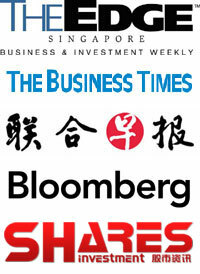 For investment merits and risks, readers can refer to this website HERE for the analyst reports. RHB has a buy call with a target price $0.140. Personally, I am not familiar with the company and I do not have direct management access. As stocks carry risk and everybody is different, readers are encouraged to do your own due diligence before committing to any trade or investment decision. This article highlights the interesting aspects of Moya’s rights issue and that its major shareholders have raised stake above their entitlement. In addition, Moya’s chart looks positive. All in, this stock bears watching. P.S: I am vested in Moya shares, for trading purposes. Do note as I am a full time remisier, I can enter or exit my positions quickly, depending on market developments. acquire, acquisition, analyst, Asia, BOT, build, chart, Ernest, exercise, Gateway, hold, Indonesia, investment, lapse, loan, merit, Moya, operate, price, project, resistance, right, risk, Salim, stake, support, Tamaris, target, trade, Trading, transfer, water permalink.